This Stanley London® Prismatic Compass is a Fully Functional and accurate Prismatic Surveying Compass that comes with an aluminum tripod and canvas cases. 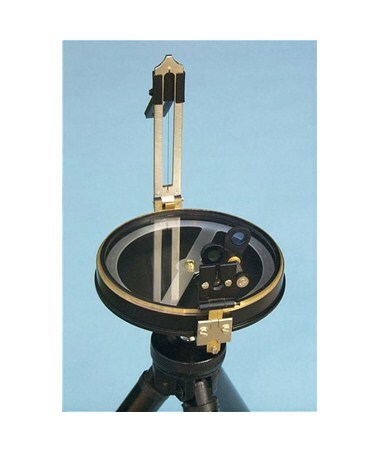 The design of the Prismatic Compass allows the user to simultaneously view the object being sighted and its magnetic heading with 1/2 degree resolution. 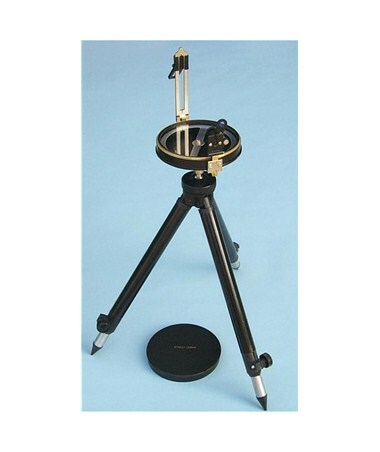 The compass case and lid is solid brass with a black powder coating. The rear sight is machined aluminum. 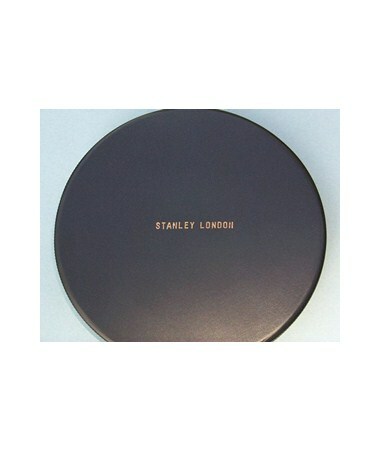 The large brass lid is stamped "Stanley London," and comes off to expose the low-inertia aluminum compass dial. The prism can be flipped up for use as a front sight, and at the same time view the compass heading. There are two colored filters that can be placed in the optical path of the measurement to reduce glare. There is a small cover that can be swung into place to protect the prism. The degree markings on the compass rose are stamped mirror image so the heading reads properly when viewed through the prism. 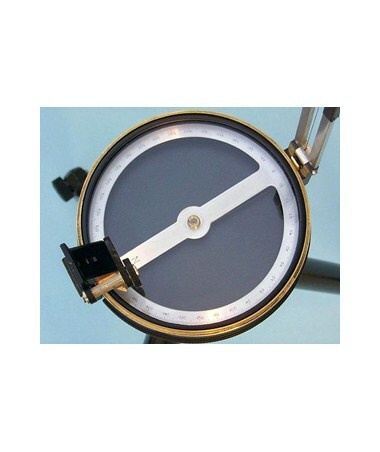 When taking a heading measurement, the magnetic heading appears clearly under the object being sighted. 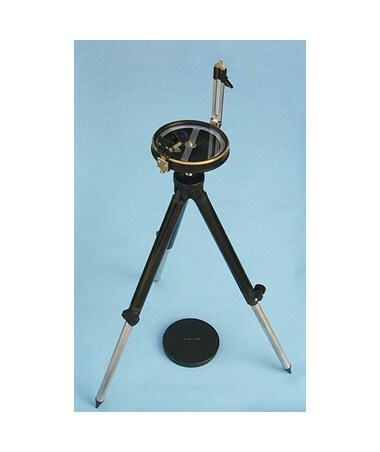 Two adjustment screws allow the height of the prism to be precisely set for proper focus. Pressing a small plunger button near the rear sight locks the compass card for easier reading. 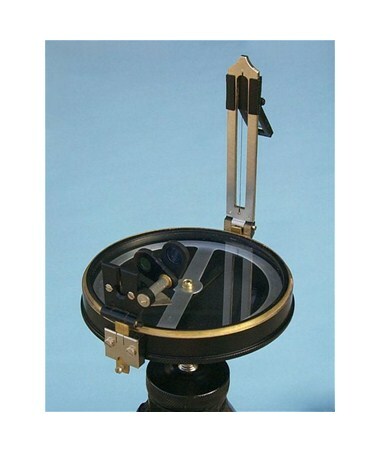 The compass has a needle lift mechanism to protect the agate compass jeweled bearing when being transported. The rear sight has a replaceable thread and a hinged mirror that can also be raised or lowered. 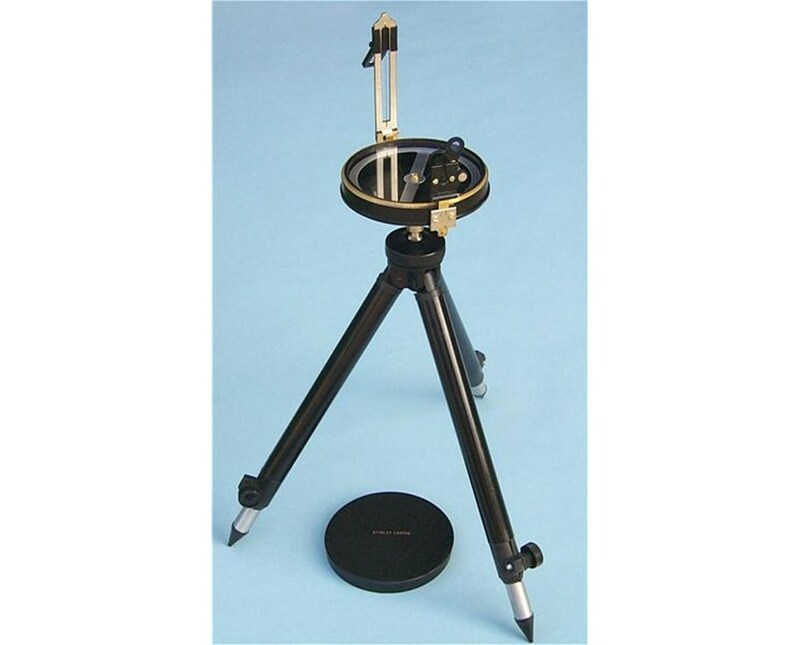 The compass can be threaded onto the lightweight surveyor's tripod with a ball and socket head using standard 3/4 inch x 24 threads. The compass measures 4 3/8 inches (11.1 cm) in diameter, 1 1/2 inches (3.8 cm) thick, and weighs one pound, 3 ounces (539 grams). 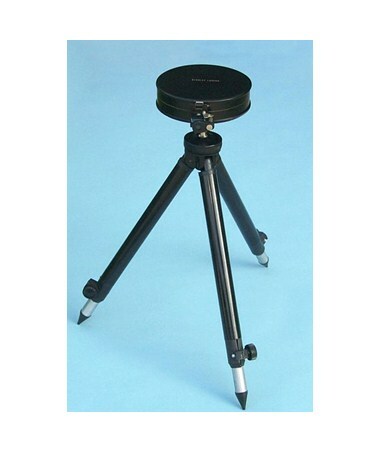 When mounted on its tripod, the height of the compass is adjustable from a minimum height of 12 1/2 inches (31.7 cm) tall is a maximum height of 21 inches (53.3 cm) tall. This compass is accurate with a resolution of 1/2 of a degree. 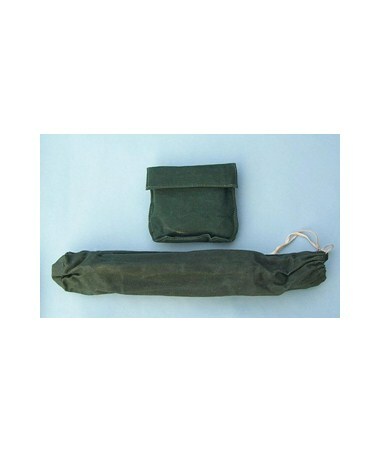 Both the compass and tripod come with canvas cases. The case for the compass has a Velcro closure and the tripod case has a draw string.